Microsoft is taking first steps in the right direction: Finally hiring designer. They've had UI designers for a while. While they're not perfect and have a fair amount of design issues, it's not fair to brush them off. They were one of the main companies that helped develop flat design in the first place. I agree on this. What I'm just saying is: they are finally heading in the right direction with their current lead & concepts. I think microsoft is going to create the most amazing stuff in the next upcoming years. I think I'm ready to switch fully to Microsoft soon. Windows 10 is great and also the interface is so far the best one we've seen from microsoft. + It's just light! I think the problem with Microsoft is that they're stuck on legacy stuff that they're scared to try new things. Don't think legacy is the (biggest) problem. Microsoft never was a design-centric company in the past, so it becomes very hard to suddenly change course in that direction, especially for a ship as big as Microsoft. They are trying but I can only imagine how frustrating it must be as a designer at Microsoft. I'm sitting next to a ex-Microsoft designer and he shared some pretty interesting things about the setup there. People sometimes fail to see that it is a very large organization after all serving a lot of people across the globe. There are tons of challenges that comes along with it at it's scale. So it's hard to recognised that it's quite a feat to be able to pull something off with alignment across god knows how many teams in there + people using the product. Don't think there is much place for this sort of sarcasm anymore when MS are shipping products like Surface Studio. No way, currently I really love Microsoft for what they are doing and heading. They are finally taking serious steps to produce great products for the industry. Excited about this, really hope they take this as an opportunity to modernise every part of the OS, Please redo all those Windows 95 control panels and stuff. Obviously that's huge probably thankless task but it will go a long way to making windows feel less like cruft built upon cruft built upon cruft built upon cruft built upon cruft. Feels like they're implementing a number of UI components that mirror what apple did with iOS and MacOS a few years ago. For what it's worth, iOS 7 took quite a few visual cues from Windows Phone. Agreed. I'll allow myself to be pegged as the Apple fanboy (our entire studio owns one of everything), but Microsoft did arrive in that realm first. The Zune (dogshit hardware with awesome UI) was so early that the industry didn't understand it for what it could truly be. Also, for anyone who didn't notice, this looks like the spiritual return of Rdio! Glad someone remembers MS pioneered this whole trend but pretty much got laughed at when iOS was still a leather and paper filled nightmare. Not to mention Windows Aero being the first to use background blur (thanks, GPU mipmaps!). Everything is a remix. Looking decent! However, what's with the 50-100px margin between the close/max/min buttons and the border? Holy mega windows. A guess: It might be some touch optimisation. Valid point! I could see that being nice now. For desktop users, I think I would find it annoying. It seems like such a weird use of real estate to me. I agree. I’m all for big button areas, but the balance doesn’t seem right on those toolbars. Still, it’s only a leaked non-release version. Hopefully things get tightened up before launch. Looks like they're trying to make a tighter integration between the industrial design of their Surface line and the OS. It looks neat! 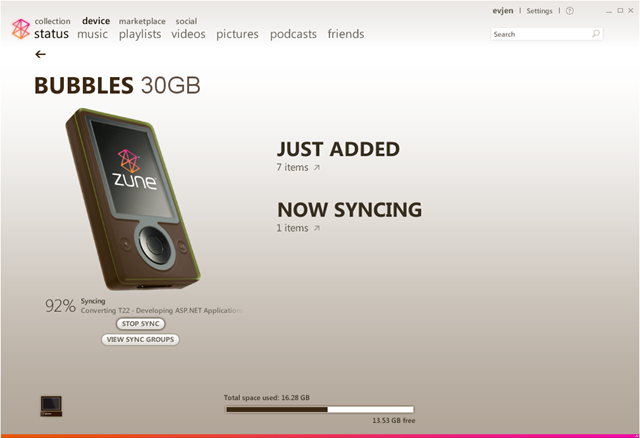 Looks nice, it reminds me of Zune. Now please get rid of the sharp edges on the window panels. Also yeah, large parts of Windows still look legacy. A lot of dated icons and system apps from the Windows XP era that didn't change one bit over all those years.